The musical offerings presented on this disc celebrate my mother’s influence in my life but also pay tribute to our cultural heritage through dances, songs and nationalism. Afro-Cuban dance rhythms in the music of civil engineer, composer and songwriter, José Antonio "Ñico" Rojas (1921-2008), serve as a musical fingerprint that forms an integral part of his writing style. Born in Habana, Cuba, Rojas was exposed to both classical and popular music from an early age. He was a self-taught guitarist and began learning the instrument at age 18. In the early 40’s he became one of the founding members of the "Fílin" (feeling) movement – a group of Cuban musicians that drew musical inspiration from the bolero tradition, jazz, blues and film scores. In 1950, these influences converged in the works of Ñico and a new form of instrumental guitar writing emerged. Guajira a mi Madre is based on the Cuban Guajira-son rhythm and is a favorite among guitarists. Its constant syncopation sophisticated jazz harmonies and infectious melodies contribute to its enchantment for both listeners and performers alike. The Argentinean dance known as "Tango" surfaced in the port city of Buenos Aires at the turn of the 20th century. Astor Piazzolla is the father of the "Nuevo Tango" and a pivotal figure in the development and evolution of the genre. Piazzolla was born in Mar de Plata, Argentina in 1921 but moved to New York City with his family at age four and remained there until 1936. He studied with Alberto Ginastera, in Argentina, and with world-renowned music educator Nadja Boulanger while studying in Paris in 1954. His Cuatro Estaciones Porteñas (Four Seasons in Buenos Aires) were all composed at different time periods and not initially grouped as a suite. Verano Porteño was written in 1965 as incidental music for the play 'Melenita de Oro' by Alberto Rodríguez Muñoz and was originally scored for violin, electric guitar, piano, double bass and bandoneón. Combining elements of song and dance, the music of Paraguayan guitar virtuoso, poet and writer, Agustín Barrios (1885-1944) is lauded by its originality and beauty. Despite his indisputable technical prowess and the undeniable quality of his works, Barrios’ career did not have the same degree of international success and attention as that of his contemporary Andrés Segovia (1893-1987). As a result, disillusioned and perhaps in an attempt to reconcile his lack of professional success with a sense of purpose, Barrios assumes a new persona and adopts the pseudonym "Nitsuga Mangore" proclaiming that he is "the messenger of the Guarani race…the Paganini of the guitar from the jungles of Paraguay". By 1934, Barrios drops the pseudonym but retains Mangore and continued to present himself as Agustin Barrios Mangore. He died in El Salvador in 1944 never enjoying the success he longed for. Barrios’ romantic writing seams together folkloric themes infused with neo-classical European musical traditions. Choro de Saudade is a nostalgic work that features rhythmic qualities of the Brazilian Choro while Julia Florida is written in the style of a Barcarole. José Luis Merlin’s (b. 1952) Suite del Recuerdo was written in 1990 and is dedicated to the iconic Argentinean singer, poet and guitarist Atahualpa Yupanqui (1908-1992). As a young boy, Atahualpa and his father, a train conductor, traveled across the Argentinean countryside. It was through these trips where Yupanqui became intimately acquainted and connected with the landscapes and music of Argentina. His songs and poems are melancholic, poetic, nationalistic, and deeply romantic but also speak to the social injustice and suffering of his countrymen. They are a testament to the wealth and breadth of his cultural legacy. Merlin’s Suite del Recuerdo includes an Evocación, Zamba, Chacarera, Carnavalito and Joropo. These movements portray elements of Atahualpa Yupanqui’s musical characteristics and include musical quotations from some his songs. Jorge Cardoso (b. 1949) has the great distinction of being both a musician and medical doctor. With a career that spans over five decades and hundreds of compositions, his artistic and compositional output is impressive. Cardoso’s nationalistic music, profoundly influenced by Argentinean folk music, includes dances such as tangos, chacareras, milongas and zambas that are elegantly interweaved within choral, orchestral, chamber and solo pieces. His Milonga from 24 Piezas Sudamericanas is a charming work that showcases Cardoso’s flair for rhythmically driven melody. Brazilian guitarist, composer and teacher, Dilermando Reis (1916-1977), is a pioneer in the development of a nationalistic Brazilian guitar style during the 20th century. His compositions and arrangements show a predilection for 19th century European dances such as waltzes, schottisches and polkas interpreted through Brazilian sensibilities. Dilermando composed 129 works that span over a 30-year artistic career and the recordings of these works served as reference to a new generation of guitarists. Published in 1954, Se Ela Perguntar (If She Asks) is perhaps Reis’s most well-known and performed composition. It is a waltz cast in ternary form that exemplifies Dilermando’s propensity for elegant and lyrical melodic writing. La Mora Limpia is considered to be Nicaragua’s second unofficial national anthem. Its popularity in the country is unparalleled as is its association with national identity and cultural pride for those who live abroad. Nicaraguan composer, guitarist and singer, Justo Santos (1925-1958) penned the piece in 1952 as a submission for a music contest to celebrate the centenary anniversary of the capital city of Managua. La Mora Limpia did not win over the jury and was not selected as the winning submission but it won over the hearts of the people. The piece is written in the style of the Nicaraguan Son (Son Nica) and showcases a hemiola that juxtaposes 3/4 and 6/8 meters where the melodic line is in 6/8 and the accompaniment is in 3/4 with accents on beats 2 and 3. Mexican composer Manuel María Ponce (1882-1948) is a central figure in the history of the guitar. Though not a guitarist himself, Ponce’s relationship and collaboration with the great Spanish guitarist Andres Segovia produced one of the largest bodies of work for classical guitar in the first half of the 20th century. Ponce’s output includes five sonatas, a concerto and chamber works that are at the core of the instrument’s repertoire. Written in 1912, the song Estrellita is the composer’s most popular and beloved work. Despite its popularity, Ponce never received royalties for the piece as he failed to secure copyrights during its publication in 1914. Inspired by the beauty of Mexican night sky, the work reveals a lyrical romantic style sprinkled with subtle chromaticism and supported by simple yet surprising harmonies. The works contained in this album are of great symbolic significance to guitar repertoire. They embody the beauty, landscapes and history of Latin American heritage and have a special place in my musical development. I hope you enjoy listening to these pieces as much I enjoyed recording them. "Soulful and virtually flawless," hails the Portland Oregonian and the Boston Globe writes, "In warm, round tones, the notes of Bach cascaded from the guitar, every note correct and played without hesitation." Classical guitarist, pedagogue and educator Isaac Bustos, enjoys an extensive performing career that has taken him to Canada, Central America, Europe and all over the US. Dr. Bustos has made several Radio and Television appearances and is in demand as clinician and master class teacher invited to perform in some of the most prestigious festivals including the Guitar Foundation of America Annual Convention, Portland Guitar Festival, St. Joseph International Guitar Festival, Southwest Guitar Festival, Brownsville Guitar Festival, Classical Minds Festival, Festival Internacional de Guitarra Monterrey, Festival Ramon Noble and Festival del Noreste in Mexico. Isaac has also appeared as soloist with the Orchestra of New Spain, The Baytown Symphony Orchestra, The Nicaraguan National Symphony Orchestra and the Buffalo Philharmonic Orchestra under the baton of Maestro JoAnn Falletta. Isaac holds an impressive number of top prizes in over 12 major international competitions, 7 of which are first prizes. In the fall of 2008, Isaac released his debut CD titled Caprichos y Sonatas which Soundboard magazine described as "…one of the best…it has everything one could want." 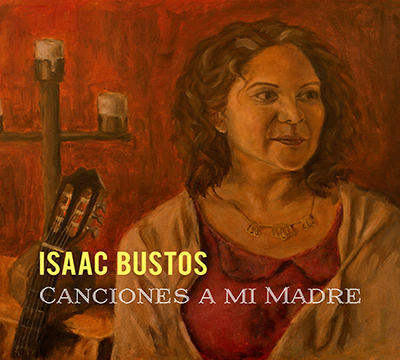 Bustos is a featured artist for the Vgo Recordings label and has just released his second album titled "Canciones a mi Madre". The album contains Latin American guitar from Brazil, Cuba, Nicaragua and Argentina. Additionally, Isaa has premiered new guitar works by composers Nico Muhly, Frank Wallace, Mark Cruz, Joe Williams II and recorded the world-premiere recording of Peter Lieuwen’s Sonata for guitar on the MSR Classics label. Chamber music collaborations include performances with Grammy award winning artists LAGQ and Conspirare Choir, the Turtle Creek Chorale, legendary Mexican cellist Carlos Prieto, and the Axiom String Quartet. Bustos is also a founding member of and performs regularly with the award-winning Texas Guitar Quartet. Their critically acclaimed debut recording titled "RED" was released in the spring of 2012. Bustos holds a Bachelor of Music degree in guitar performance from the University of New Hampshire, where he was the only guitarist to ever hold a full scholarship, a Master of Music degree from the University of Texas at Austin where he also completed a Doctor of Musical Arts degree under the tutelage of world-renowned American guitarist Adam Holzman. As an educator, his commitment to teaching is reflected in the success of his students whose prize-winning performances have included victories in the Eastfield Guitar Festival and competition, Brownsville Guitar Ensemble Competition, "Classical Minds" Guitar Competition, Houston Young Artist, East Carolina University Competition, Rosario Competition, Appalachian State Competition, Boston Guitar Fest International Competition and Guitar Foundation of America International Youth Competition. Since 2005, Dr. Bustos serves on the faculty at Texas A&M University Department of Performance Studies where he is head of guitar studies and artistic director of the Texas A&M International Guitar Symposium and Competition.